If you are looking for a delicious, comforting and satisfying meal, then I think I might have something interesting for you today! 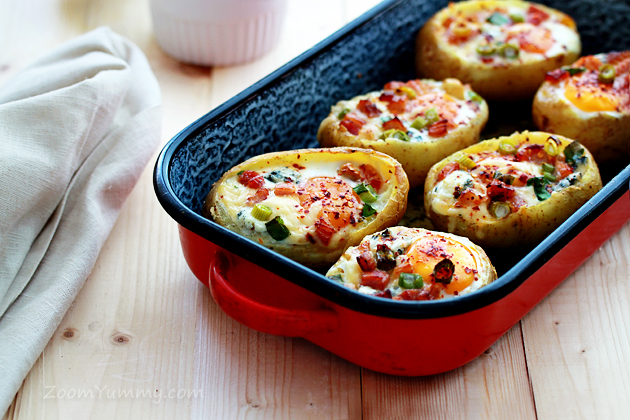 These Baked Egg Potato Bowls are filled with the most delectable ingredients I can imagine – bacon, cheese and yummy green onions all combined inside a lovely baked potato. Well, all I can say to this is one big YES! 1. 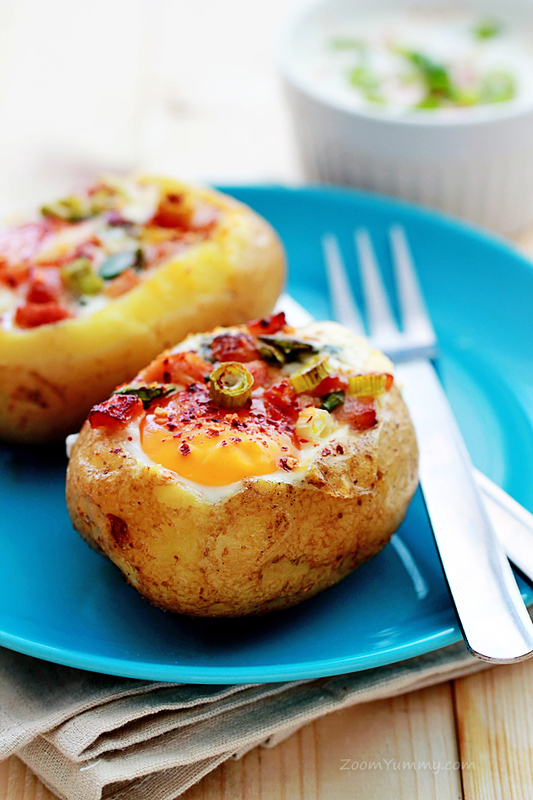 To prepare your Baked Egg Potato Bowls, first preheat the oven to 400 °F (200 °C). 2. Then wash the whole potatoes under running water thoroughly (I did that with a brush that I only use to clean my vegetables). 3. 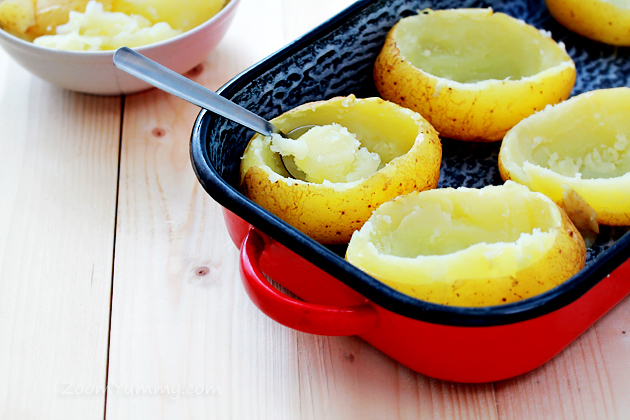 Bake the potatoes until they are cooked through and soft inside (it will take about 40 minutes). You can check whether your potatoes are cooked through by running a knife through their centers – if the knife runs rather smoothly and there’s not much resistance, the potatoes are done. 4. Remove the potatoes from the oven and let them cool to the temperature that will allow you to handle them with your hands. 5. Decrease the oven temperature to 350 °F (175 °C). 6. Slice a layer off the top of each potato. Using a spoon, gently scoop out the insides, leaving a thin layer of potato against the skin and avoiding puncturing the bottom. Reserve the scooped potato for another use (I made us some mashed potatoes for dinner). 7. 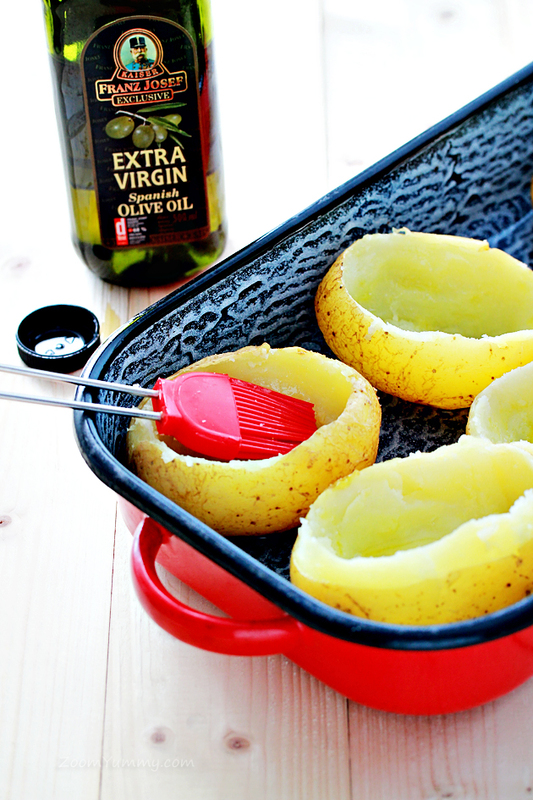 Brush the inside of each potato with the olive oil. 8. Add a little salt, pepper and red pepper flakes. 9. Sprinkle a layer of bacon, thin slices of green onions and some grated or shredded cheese into each potato (I used grated Edam cheese and some cubed blue cheese). Fill each potato about 1/2 full. 10. 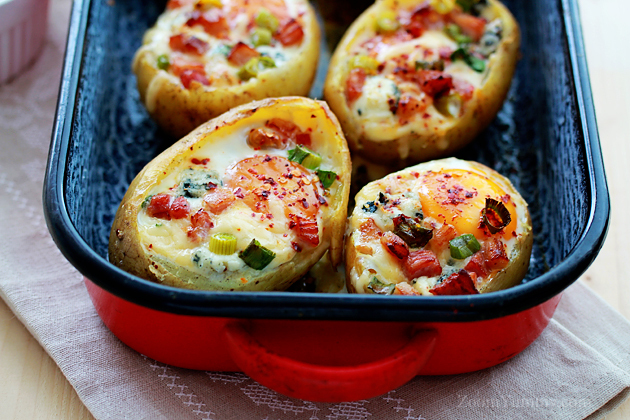 Crack one egg into each potato. 11. Sprinkle with a little more bacon, onion slices and cheese. Then top with more salt, pepper and red pepper flakes. 12. 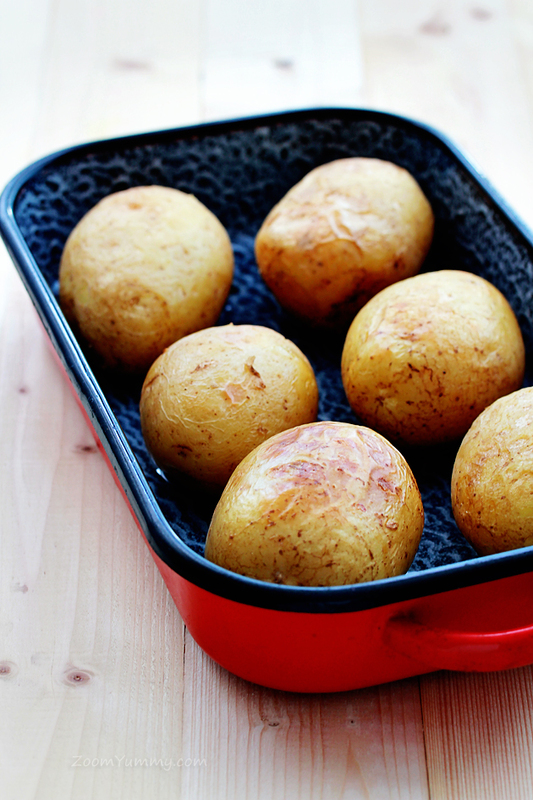 Place the potatoes on a baking sheet and cook for about 20 minutes. Egg whites should be set and yolks soft. 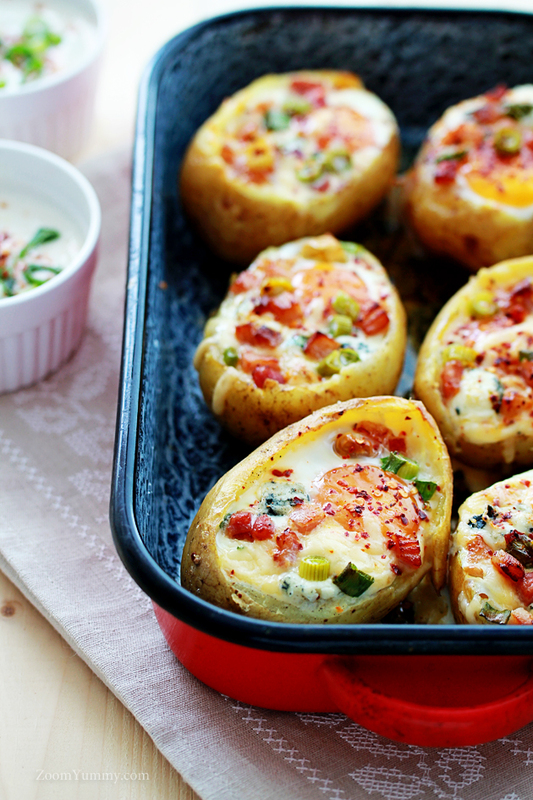 We enjoyed our Baked Potato Bowls with some very simple garlic yogurt dip. To prepare it, just combine low fat yogurt with some fresh or powdered garlic and a little bit of lemon juice. Then add salt to taste – and that’s it! Enjoy, dear friends! This is good! Wash the whole potatoes under running water thoroughly. 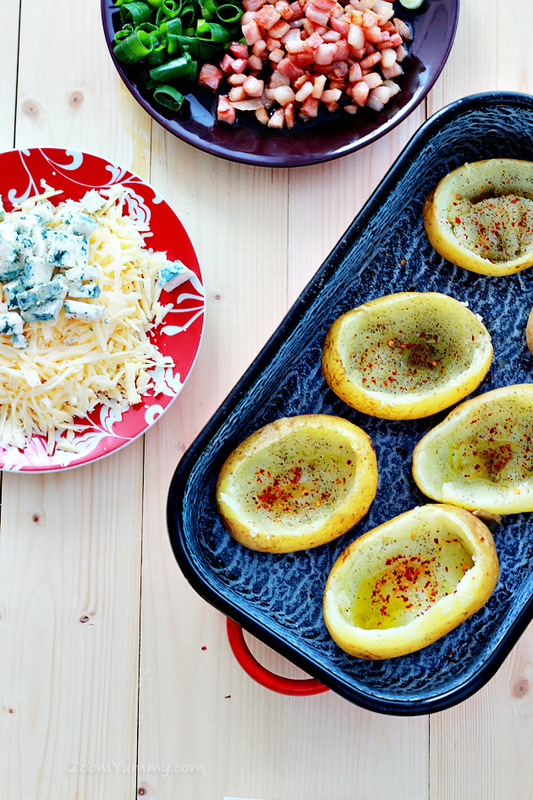 Bake the potatoes until they are cooked through and soft inside (it will take about 40 minutes). Remove the potatoes from the oven and let them cool to the temperature that will allow you to handle them with your hands. Decrease the oven temperature to 350 °F (175 °C). Slice a layer off the top of each potato. Using a spoon, gently scoop out insides, leaving a thin layer of potato against the skin and avoiding puncturing the bottom. Reserve the scooped potato for another use. 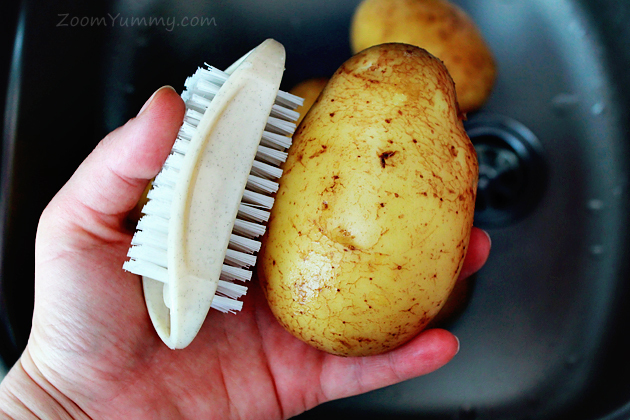 Brush the inside of each potato with the olive oil. Add a little salt, pepper and red pepper flakes. 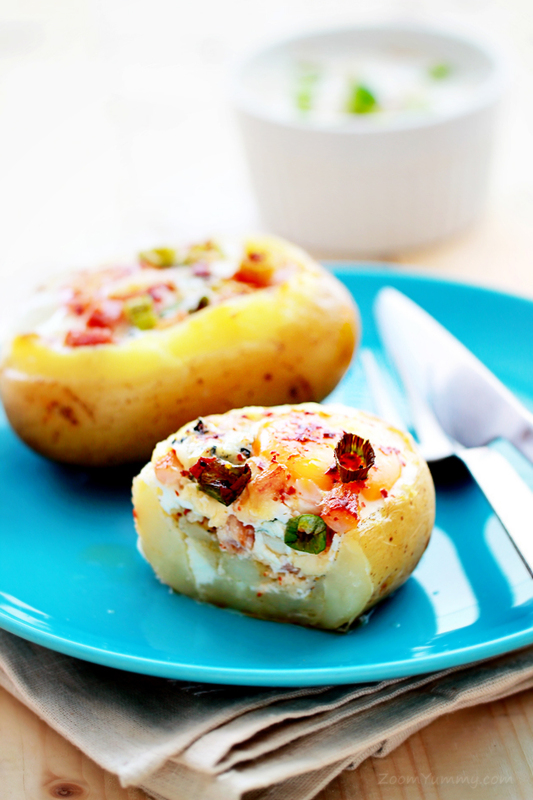 Sprinkle a layer of bacon, thin slices of green onions and some shredded cheese into each potato. Fill each potato about ½ full. 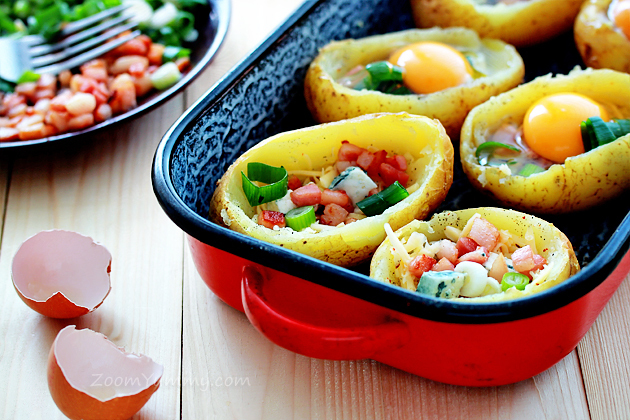 Crack one egg into each potato. Sprinkle with a little more bacon, onion slices and cheese. Then top with more salt, pepper and red pepper flakes. Place the potatoes on a baking sheet and cook for about 20 minutes.Egg whites should be set and yolks soft. (This recipe was adapted from www.ourbestbites.com). Fantastic!!! Excellent recipe, I love it. Well done!!! What a great idea! I love this and will have to try it out. That’s a wonderful idea. Thanks for the recipe. 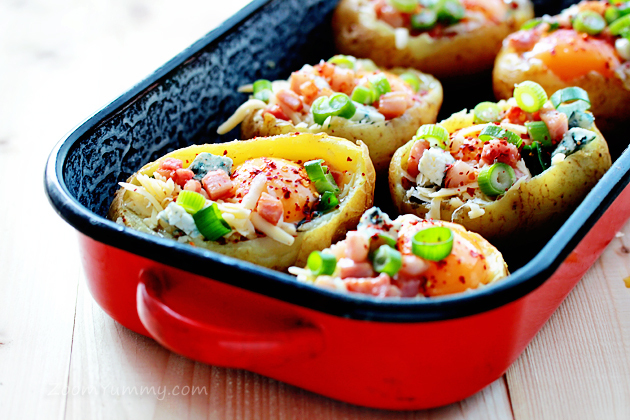 I also tried a similar recipe once, however I stuffed the potato boats with the same potato inside, only added some bacon, cheese and seasoning. It was delicious anyway, but I’m sure this is better. I’m already drooling.